How to cut your electricity bill and save money with the aid of an electricity usage monitor, without cutting your home comforts. I'm not a green person by nature so the only reason for reducing my energy usage is to save money, but I do so reluctantly and not at the expense of my home comforts if I can help it. 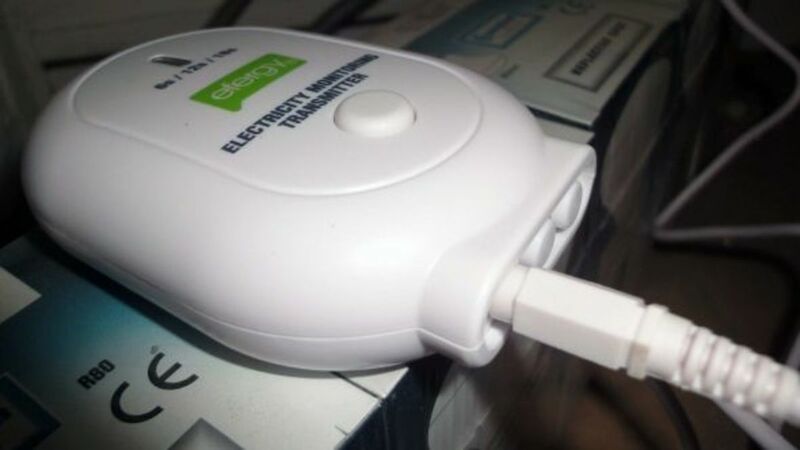 Therefore when I was given an electricity usage monitor, with claims on the package that it could help me reduce my electricity bill by 20% I was dubious but willing to give it a spin. 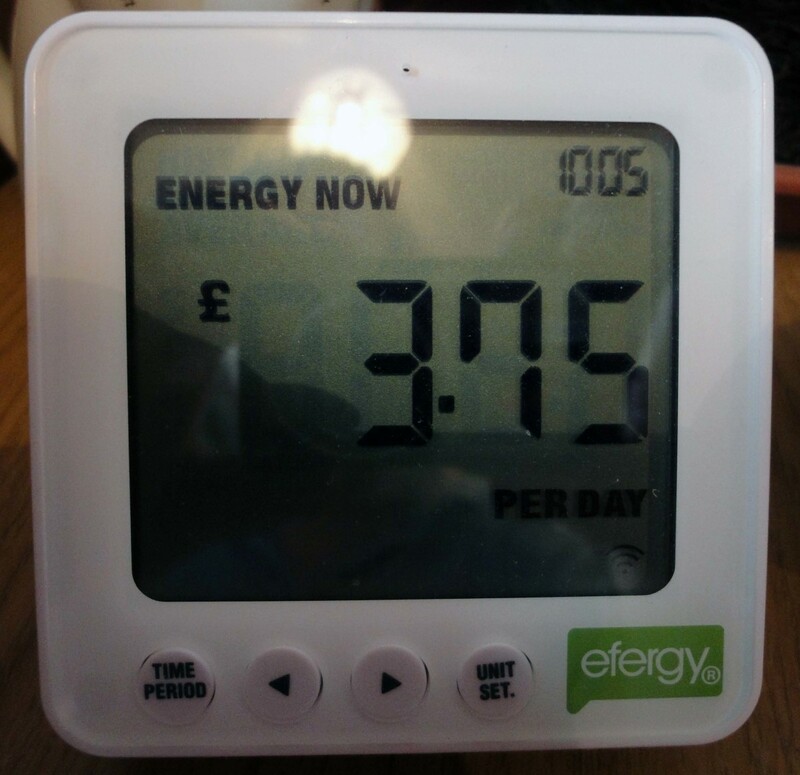 The electricity usage monitor was a free gift my son had for attending a free one day course; he had a choice between a sat-nav and this monitor. His first choice was the sat-nav but on looking at it he changed his mind because it was only a cheap model and not that great, so he took the electricity usage monitor for me instead. When I went to the official website to download the free computer software for the monitor I noted the monitor he was given sells for 60 euros so it was a true bargain. 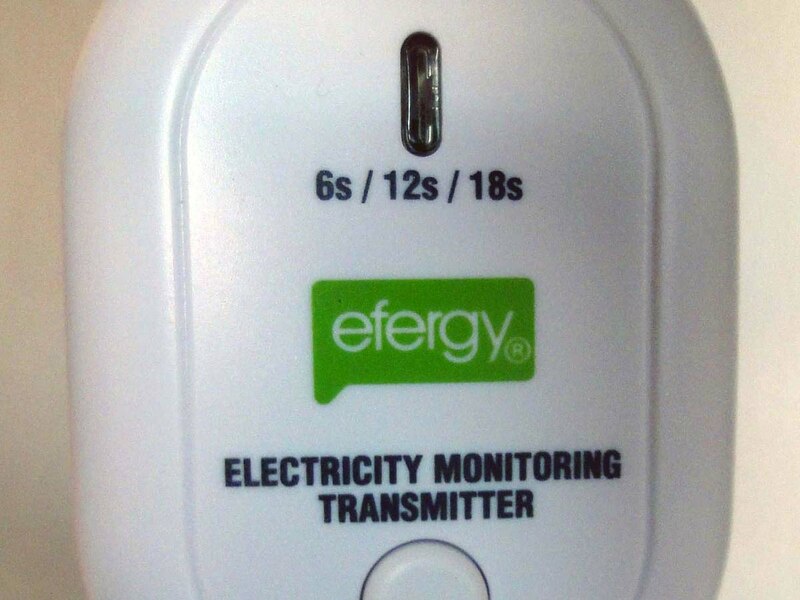 The concept is relatively new and apart from the Efergy monitor there doesn’t seem to be much choice for a good all round device that monitors total real time consumption for the whole home. Most devices seem to be for monitoring individual appliances only. 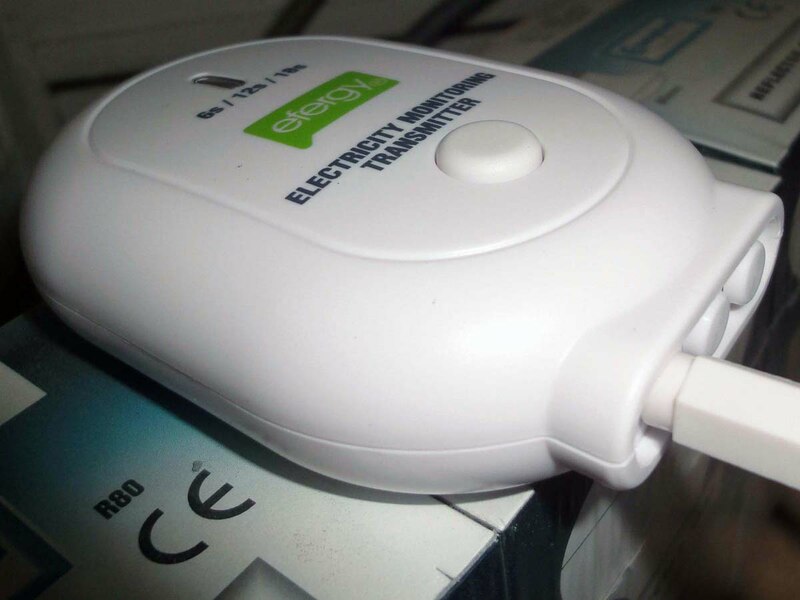 What is an Electricity Usage Monitor? 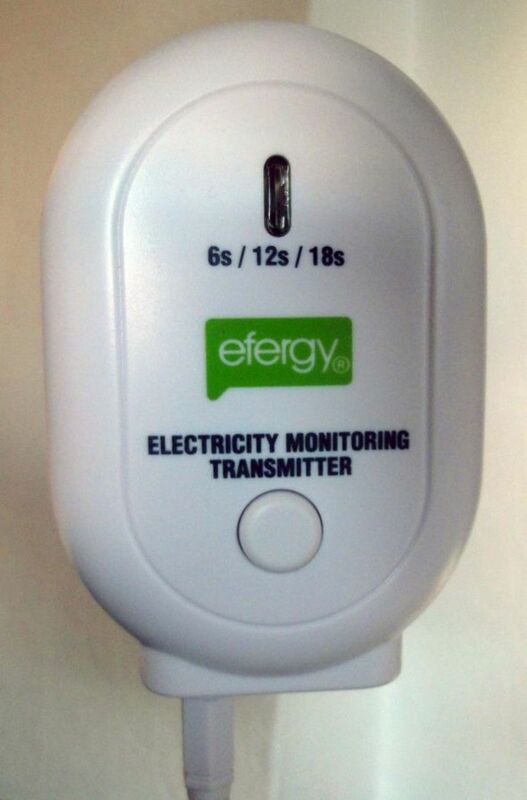 An electricity usage monitor is what it says on the package, it monitors your usage of electricity. 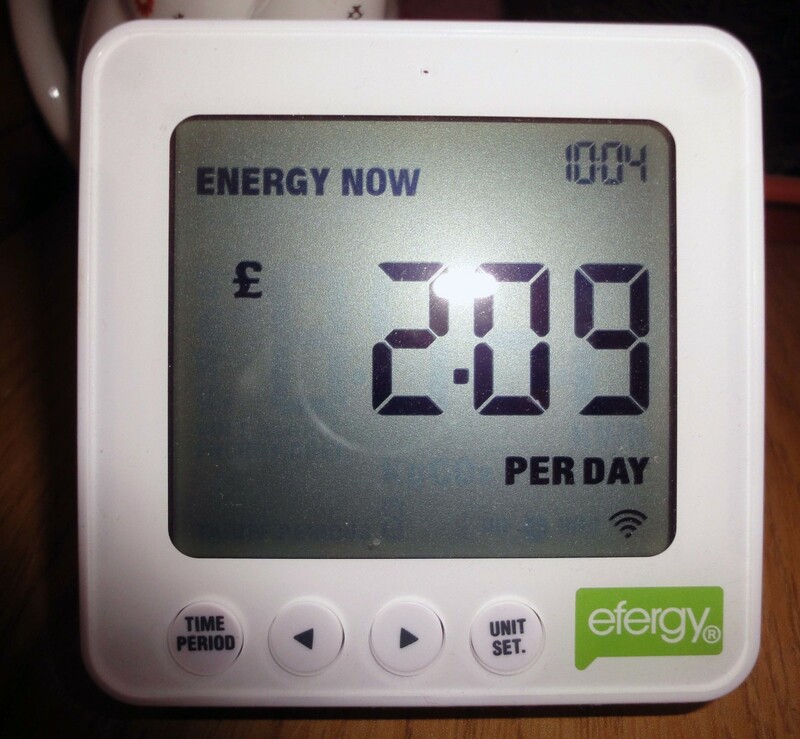 You might say your electricity metre does that, and it does; however, what makes these monitors really useful is that they monitor your electricity consumption and displays it real time on a small screen right in your livening room so at a glance you are aware of your electricity consumption as it happens. The monitor comes in two parts, one part which monitors the flow of current fits over the mains live supply to your electricity metre and this sends regular signals to the other part that displays the power being used and sits in your living room. Fit batteries in both bits of kit; for some models the display monitor works from the mains rather than battery. Press a few sequence of buttons to set up the date and time and your current billing charge per kWh (kilowatt hour). 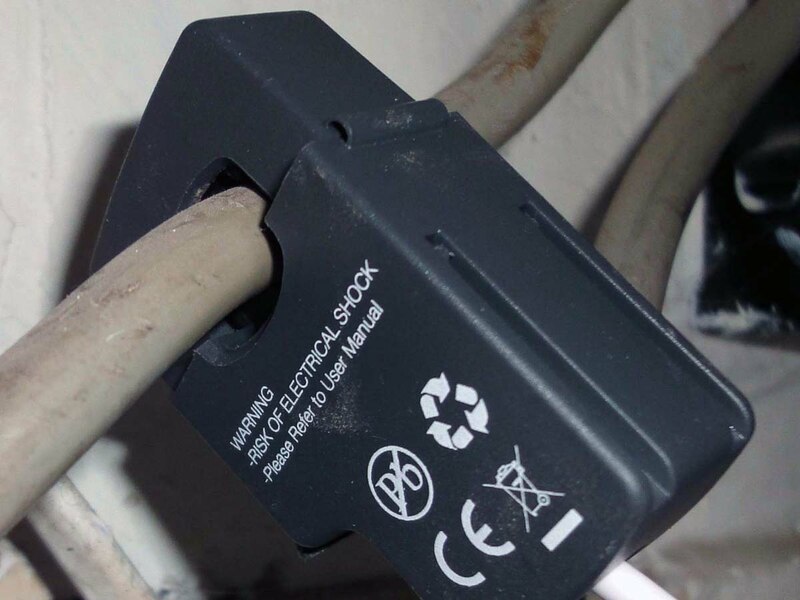 Clip the monitoring part of the kit loosely over the live mains cable feeding your fuse box from your electricity metre. Press the synchronising button on both bits of the kit so they synchronise with each other e.g. you wouldn't want to be monitoring your neighbours power consumption by accident if they happened to have the same kit as you. Place the Display unit anywhere convenient so that you can easily see it and start monitoring how much power you and your family are using. 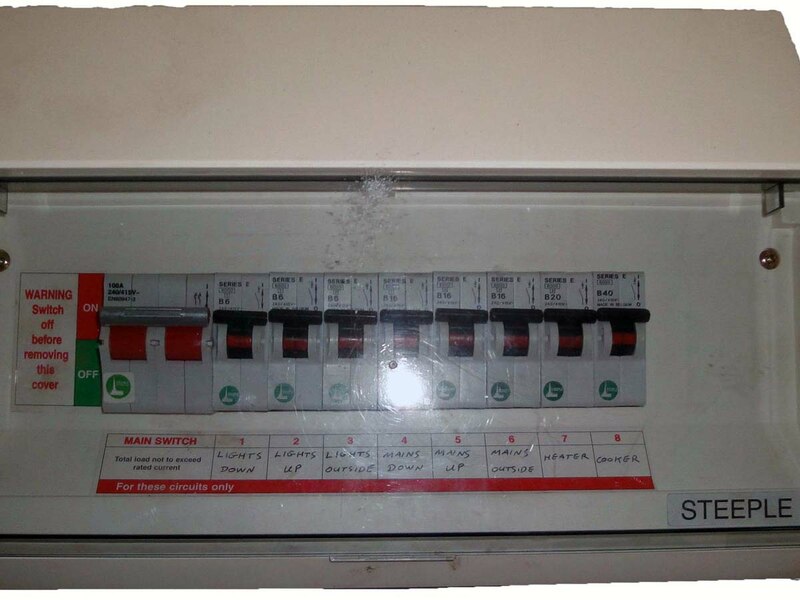 Loosely clip energy sensor around live cable leading from the electricity meter to the consumer unit. Where do You Get an Electricity Usage Monitor? I'm not a very green person so it's not a subject I know much about but I do know that in the UK the Government, in an attempt to meet its international commitment to reducing the nations carbon footprint, have brokered deals with the power supply companies to offer deals either to supply cheap or free electricity usage monitors to their customers, and in exchange the power supply companies can raise their prices to recover their costs in the long run e.g. a backdoor form of green tax. Which with increasing energy prices gives added incentive to home owners to find ways to reduce their energy bill; one novel way is the right of home owners who produce surplus energy to sell their surplus back to their main energy supplier e.g. 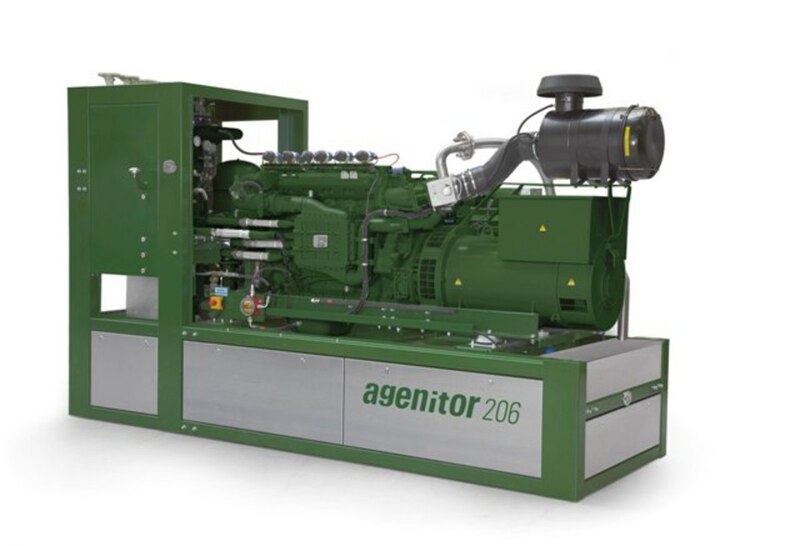 through generating surplus energy from wind generators in their back garden or solar panels on their roof. As well as offers from your energy supplier you can also buy these units from the web and, as in our case, get one as a free gift e.g. they could make great birthday presents. The model we have stores the data and has a USB port so you can periodically upload the stored data from the display monitor to your computer and with the aid of the free software available from the unit's suppliers official website you can analyse the data to your heart's content comparing usage and trends over months and years. 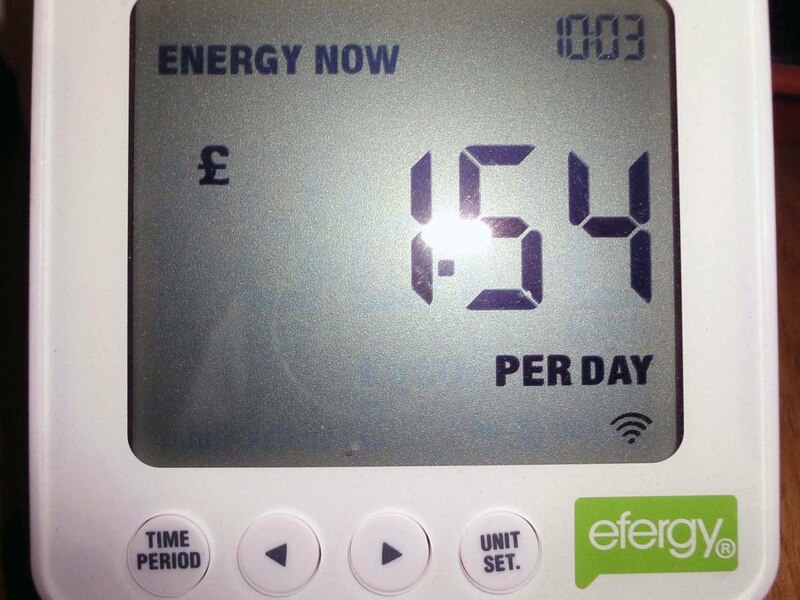 The unit a friend of ours got from his energy supplier doesn't have this facility so he can only see current trends from the display monitor itself. 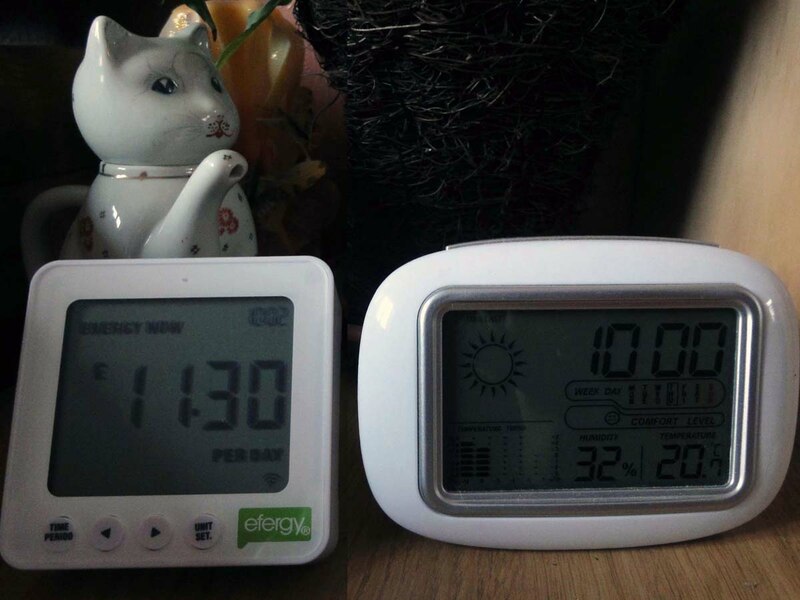 The other difference between the unit we have and the one our friend has is that ours displays the usage as an 'as at' as a how much it would cost over 24 hours whereas our friend's display monitor shows the figure for one hour usage e.g. how much it would cost per hour if the current usage of electricity were to remain constant. No doubt there will be other slight variations in other models so if you wish to do more than see an 'as at' usage you may wish to look around for the electricity usage monitor that best meets your requirements. On the other hand, if you're not fussy then look around for the best deal offer for getting one, either with your energy supplier or from the web. If you buy a unit from the web it's not going to pay for itself instantly but the chances are is that it will have paid for itself within the first year; and then any savings you make from then on goes into your own pocket. 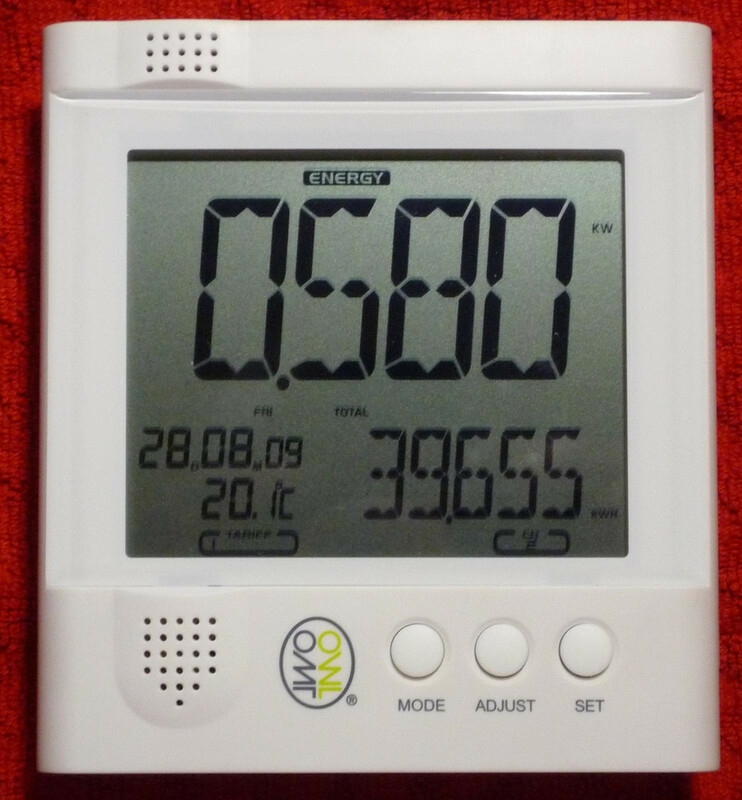 Like the energy usage monitor in this review article the transmitter is installed inside your electric box and sends an updated reading of your electricity usage every six seconds to the easy to read display monitor. 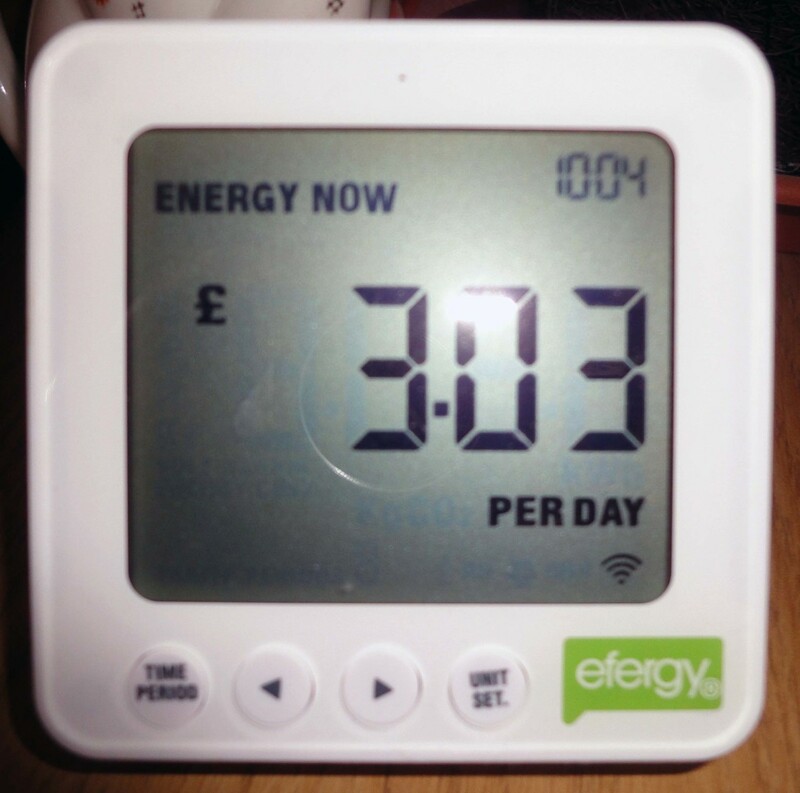 How Can an Energy Usage Monitor Save You Money? I'm not the sort of person who's going to become obsessive about using the electricity usage monitor to the detriment of my own home comforts so I was rather dubious about the claims on the box that it could help to save me 20% on my electrify bill. It make you more aware of current electricity usage and costs, 'as at' and trends, which helps you to take action (immediately or later) to cut down on energy usage without reducing your living comforts. Potentially, the electricity usage monitor can also alert you when something in the house has been accidentally left on so that you can take immediate action to turn it off. I say potentially because it depends how visible and noticeable the display is from where you are sitting in the living room. In our case the display monitor has a back support stand that angles it up towards the light, just at the right angle so the light from the electric lights in the ceiling bounce off the monitor display back into the room at eye level e.g. so it illuminate the figures on the display and everyone sitting in the living room can easily see the display. We also have the unit siting on a small table by the TV so it can easily be glanced at periodically when watching telly. In contrast the unit our friend obtained from their energy supplier doesn't have the back stand support so it just stands straight upright and doesn't reflect the light from the ceiling lights, therefore the figures are not illuminated and you can only see the display if you stand up and take a close look at it. The unit works by transmitting updated live power consumption from the monitor near your electricity metre to the display monitor every few seconds, in our case it's every six seconds; and for our friend's monitor I think it's every eight seconds. When you set the unit up you can choose the default display e.g. kWh, cost, carbon footprint etc., and at any point briefly switch to any of the other views by simply pressing a large button on the top of the display monitor. The default display we and our friend has chosen is the one that shows constantly updated 'as at' costs. Our monitor displays the current 'as at' cost extended over 24 hours and our friends monitor shows the amount extended over one hour. Cost per hour (as our friend's monitor displays it) is useful in that if you turn a light on the display might go up 1p or if you put the kettle on 10p e.g. how much extra it would cost per hour if the light stayed on for the hour or the kettle continued to boil none stop for an hour; although the kettle is on for only a couple of minutes so unless you're constantly boiling the kettle throughout the day it's not going to add much to the electricity bill. However, our monitor displays the data for a 24 hour period which gives more striking figures which are more likely to shock people into being more conscious about leaving that unwanted light on in the hall. For example, turning a light on may make the display jump 25p and turning the kettle on will make it jump 10 momentary until the kettle is boiled. A penny an hour for leaving a light on may not sound much but if that light were to be left on for 24 hours it becomes 24p a day which over a month would be 7.20 and over a year 87.60. And that's just for one light bulb, if you're in the habit of leaving lights and other equipment on all over the house needlessly then the cost could so easily far exceed 20% of what it could be if you just turn things off when not required. I haven't gone as far as turning everything completely off when not in use, these days most equipment in standby mode doesn't use a great deal of electricity so the savings for turning them off completely would be minimal; but I do know people who do take things this far primarily to save even more on their electricity bill rather than worrying about their carbon footprint. The kettle adds about 1.3p per minute to cost; the shower would use more power e.g. 20p for 20 minutes per day, adding 72 a year to the bill. As at power usage when computer and bedroom TV are on with fridge and freezers. As previous image plus with lights in hall and landing switched on e.g. an extra 2p an hour. As previous plus when the main TV in the living room is switched on e.g. an extra 4p an hour. As in previous image plus when the living room lights are switched on e.g. an extra 3p an hour. What is the Half Life of Bulbs? Because we tend to buy things in bulk when they are on offer and because the half-life of a bulb is a guide only and no guarantee for the full life of a light bulb we still had a good stock of tungsten bulbs (about a dozen) when the government banned the sale of tungsten light bulbs in the UK a couple of years ago. The ban on the sale of tungsten light bulbs being part of the government's strategy in an attempt to meet the nation's carbon footprint reduction as part of internationally agreed targets. 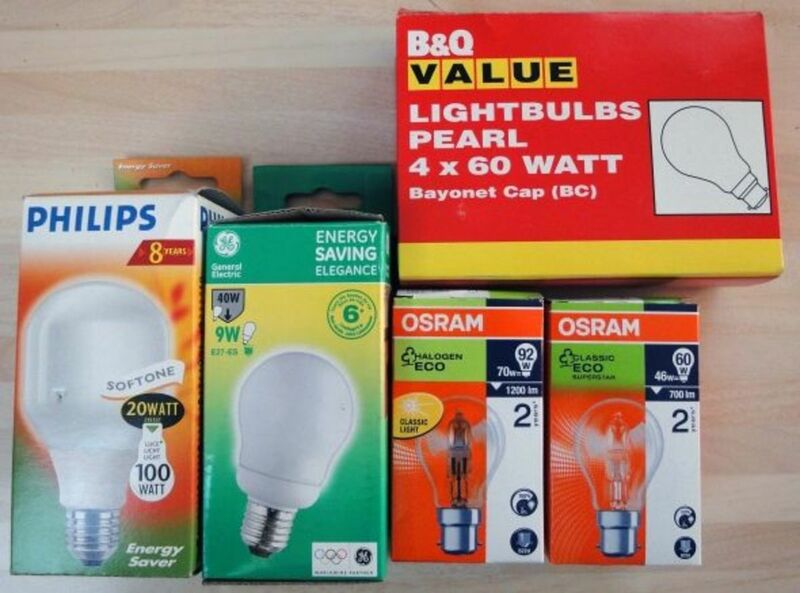 You don't see the term so prominently marked on the packaging these days but the figure is usually quoted on the box somewhere, but knowing the half-life of a bulb can be one useful factor in deciding whether purchasing a particular brand of light bulb is good value for money or not. The half-life of a light bulb is a reference to its aggregated use not age e.g. 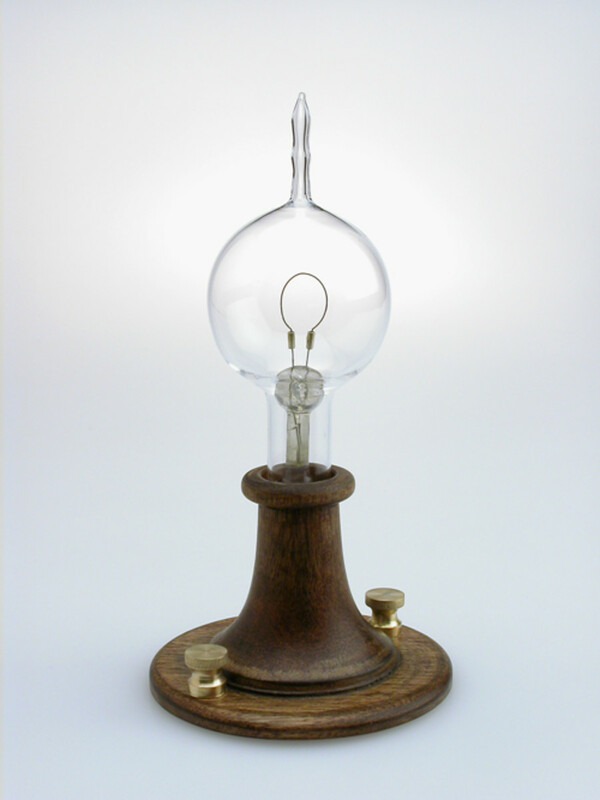 a typical tungsten light bulb will reach the half-life at 1000 hours of aggregated use. The half-life doesn't tell you how long a particular bulb will last, it only tells you that at the half-life of a light bulb e.g. 1000 hours of aggregated use half the bulbs of that type and brand will have burnt out and half the bulbs will still be shining bright. Therefore there's a 50/50 chance that an individual bulb will still be working at its half-life with a chance that the bulb may blow after only 5 minutes use or may last 2000 hours or even 5000 hours or more. We use different wattage bulbs in different rooms and in different lighting situations, such as bright lights in the living room, kitchen, dining room etc. so people can see what they are doing e.g. reading, writing, eating, cooking etc. and dimmer lights in the hall and upstairs landing, and so on. And in rooms with bright lights we'll also have wall lights or lamps for more subdued lighting when required. The spare stock of tungsten lights we had when the government banned their sale was 60w and 100w, and in their place energy saving lights at the fifth of the wattage for the apparent same brightness became available, but at ten times the price; although their half-life was typically 8000 hours instead of the old 1000 hours. We had to buy a few at the time to replace Edison type (Screw in) light fittings but most of our light fittings are still of the bayonet type and we haven't needed to replace any of these until recently. My main gripe with the energy saving light bulbs (apart from the cost) was that they were not as bright as claimed. The 100w equivalent at 20w wasn't too bad, it was close to what it should have been but the 60w equivalent took ages to brighten up and once it had never shone brightly. However that is history because we recently used our last spare tungsten light and had to go out and stock up on new light bulbs only to find the energy saving light bulbs have since been withdrawn from sale and replaced by eco halogen lights, which in my opinion are much better, and optionally LED lights. Although LED lights are very low on power consumption and very bright to use the LED lights we would have to waste money on buying adaptors for all our light fittings; so instead we've stocked up on the eco Halogen lights. The new eco halogen lights are still expensive but not as expensive as the energy saving lights; and their half-life is 2000 hours, double the half-life of the old tungsten lights. Being Halogen the eco Halogen lights are very bright. Initially we bought a 70w eco halogen light which is marked as being the equivalent to a 92w tungsten light, just shy of the 100w we use to use; but we found that to be too bright. So we tried a 46w eco halogen light, marked as being equivalent to 60w tungsten light and we found that to be just right; so it just shows how bright they are. Although the eco halogen lights use a lot more energy than the energy saving lights they replaced they still use half the energy of the old tungsten lights so as we gradually replace all our old tungsten lights throughout the house with these eco halogen bulbs we should start seeing some cost benefit on our electricity bill. The old Tungsten light bulbs which now banned from sale in the UK, they have the highest power consumption and lowest half-life e.g. 1000 hours; but were the cheapest to buy. The energy saving light bulbs which replaced the old tungsten lights in the UK, they have the lowest power consumption and highest half-life e.g. 8000 hours; but were the most expensive to buy and have now been withdrawn from sale in the UK. The eco halogen light bulbs which replaced the energy saving lights in the UK, they use more energy than the energy saving lights they replaced but less than the old tungsten lights. Their half-life is typically 2000 hours. They are cheaper to buy than the energy saving lights they replaced in the UK, and give a brighter light. I like to feel comfortable so I'll have a tendency to turn the heating up if it feels cool, although a handy little device which I had as a freebie has proved useful in helping me to make an informed decision on when to turn the heating up and when to turn it down again so that I don't turn the heating up unnecessarily. The device, pictured above, was a freebie when I agreed to a 'cold call' phone call for wine tasting in the home of very expensive wine with no obligation to buy. An offer I couldn't refuse, a chance to drink lots of free samples of very expensive and very exclusive wine and a freebie to-boot. I love wine but I prefer the taste of cheap plonk and besides I make my own wine anyway so have no need to buy any; not that I could afford expensive wine anyway. Needless to say the sales person when he arrived was as good as his word, even though I made it clear from the start that I couldn't afford such expensive vintage he did his job and gave me plenty of samples to taste and we had a good friendly chat at the same time, including me giving him my tea wine recipe (as he also makes his homemade wine); and after a good hour or so he gave me my freebie and left. 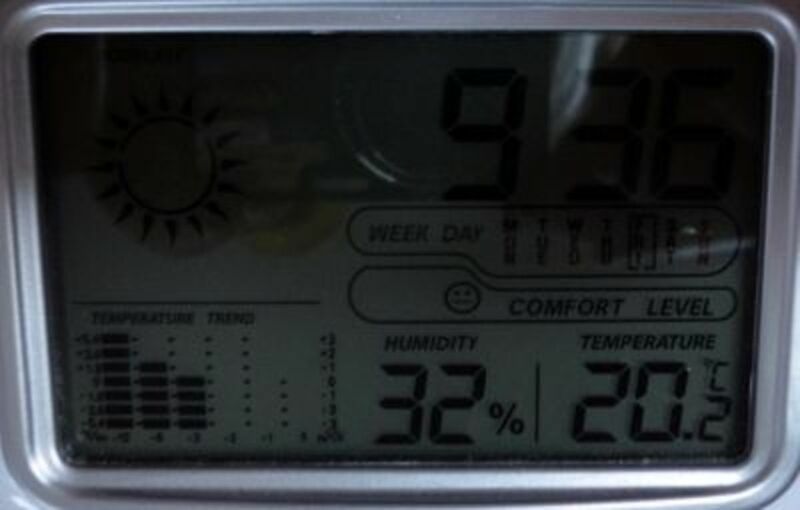 The freebie is no more than a glorified electronic barometer, although rather than picking up the outside weather it reads the indoor humidity and temperature and therefore always determines that it's going to be fine sunny weather even if it's cold, wet and windy outside. Nevertheless the temperature and temperature trends are accurate and if its feeling a bit nippy glancing at it gives a good indication on whether I should go and turn the heating up , as I would have done in the past, or let it ride seeing that it's just outside the ambient range temporally and not taking a nose dive. 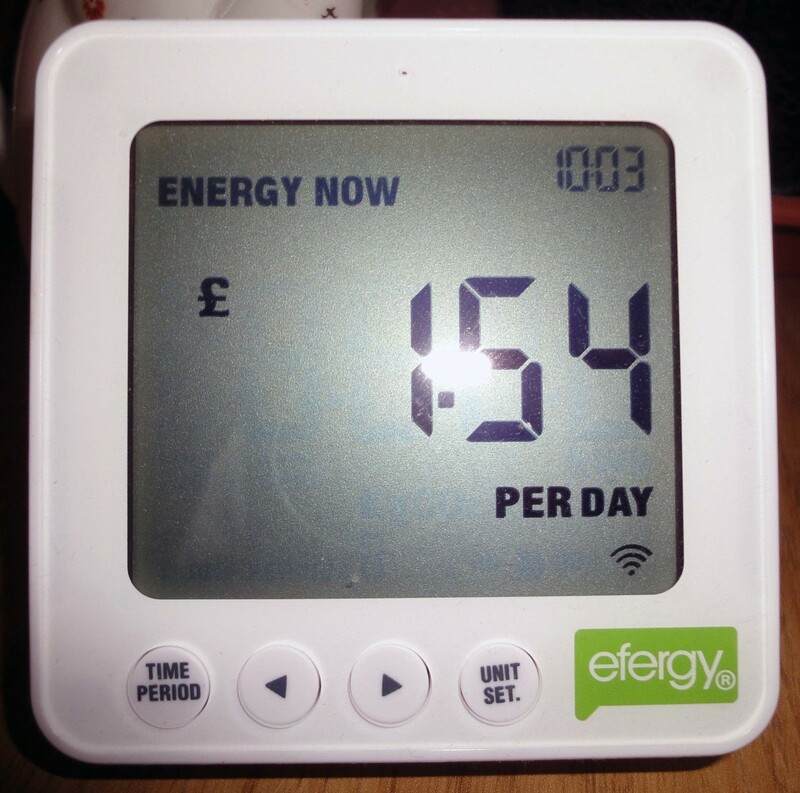 Therefore the freebie has saved money on heating, and together with the electrify usage monitor both devices are saving me pounds (dollars) on my energy bills. Are you a Green Person? Yes I try to save energy where and however I can. No I am a natural born power user. Awesome idea for power saving.So much useful for everyone.Thanks for this informative blog. Thanks for all your feedback, I guess with the debate over climate change and Europe moving rapidly towards being self sufficient in green renewable energy, being aware of energy usage is more critical now than ever before. Great Lens! Like mos_go I like everything even the tiny bits of information about saving energy. I have my A/C as well running like 24/7 and been looking around for diy solar panels (if there is one) that can help me save the $. When I saw your review on this, it makes me look around for the device or something comparable in our area. I think this is really helpful. Thank you so much! Always looking for ways to save on energy cost down here in FL where A/C is running almost year round. Thanks a lot! Great lens! Thank you so much for sharing such great information. I like saving money, especially on utility bills. We must support energy saving devices or electric saving tips for us to contribute on how we can minimize the global warming problem. With the size of my clan, I'm always looking for ways to save. Great article. Useful information here. It's great to get advice like this as energy prices keep sky rocketing. Great lens with so much helpful information. Congrats on LotD! Now Im very happy I came across this during my search for something regarding this. @Col-Hectorz: The model demonstrated in this article is UK because that's where I live; whereas the Amazon.com links in the main body on this page is for the models sold in the USA, including this model. However, the Google Ads these days are smart ads and will tend to show adverts relevant to your country. So if you saw a Google ad in the dashboard advertising this product in rather than $ it would indicate that you are browsing this article from the UK and if you click on that advert you will be taken to Amazon.co.uk or similar in England rather than Amazon.com in America. It's unclear where it is design for. I didn't read all the small print but every country have different power system. And the WEB is global, so in witch country will it be working properly ? Congratulations on your LotD. Thanks for sharing. I do try to save on electricity. I think I'll try this. It sounds easy and kind of fun. Thanks. Very nice idea! Loved reading the Lens! The idea that from within the comfort of my home, I can unplug something, and see an immediate response - powerful tool - no pun intended. Great idea to get a gadget to help determine energy usage. 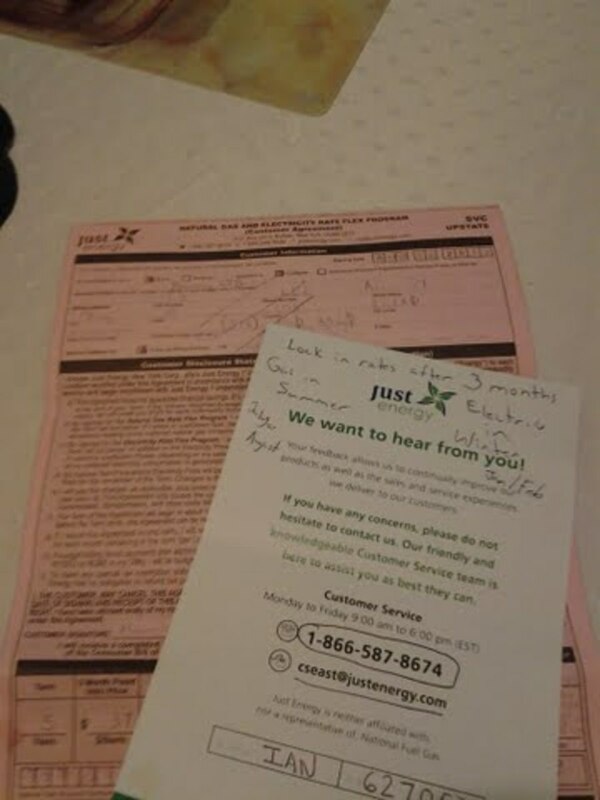 Thanks for sharing such great info about saving money using an electricity Monitor! Thanks! As the cold seasons are getting colder, this is a must. Great lens. Very timely. You really did your homework. I'll have to look into those for the US, they look a bit complicated for me. But very interesting, thanks. Interesting products and ideas for saving energy.Thanks for sharing useful information. I do use one of these, it is scary to see your electric go up when you turn something on i.e oven or kettle. It might be worth mentioning some companys provide these if you are with them. I got mine through my gas and electric provider....worth asking. I am based in the uk so not sure about other countries, but worth looking into. You did a great job with this lens! It's very interesting, very helpful, and very well written. Also, the illustrations make it even more useful. Thanks! Love this lens! Thanks to you for getting LOTD or I might have never seen it. Will look into it and maybe give it a try. Appreciate the addition of the light bulb content and nice photo's as well. Congrats, well deserved! Congrats on LOTD, I have friends who have used these meters to monitor their electricity with great success. Congratulations for getting Lens of the Day! There's a lot of useful information here. What a great lens, no wonder it become LotD. Thanks for sharing a great thing..
Congratulations on winning the Lens of the Day (LOTD) Nathanville! An excellent lens - well written with great photos and lots of useful information. Excellent Lens! I am all for saving money! Being an electric engineer I may say that your presentation is based on real facts, so operating such kind of device really worth, however, it is not able to save you energy itself. Only you can do for it, yourself. You have collected all technical details perfectly, so I enjoyed your lens. I do suggest using energy saving monitor and the methods you described. Although, the best solution would be utilization of solar energy (our only future, I think). Thanks for your useful lens! Congratulations on LotD. Appreciate this information on saving money and energy at the same time. For not being a "green person," you certainly have done a good job to help with energy conservation. Very valuable information. Congratulations on getting LotD! Thanks for this. It was well written and very informative! @HallieSpriet: Wow, Hallie, that's pretty amazing results. You've given me lots to ponder here! I've never seen one of those gizmos, but I'm all for saving electricity and will be checking into it. Thanks so much for a well-thought lens, and a big congratulations on your LOTD. Well-deserved! Great lens . . . you have highlighted some gadgets I didn't know about! Congrats on LOTD! Using fluorescent bulbs dropped our bill from $1.40/day to under $1!!! 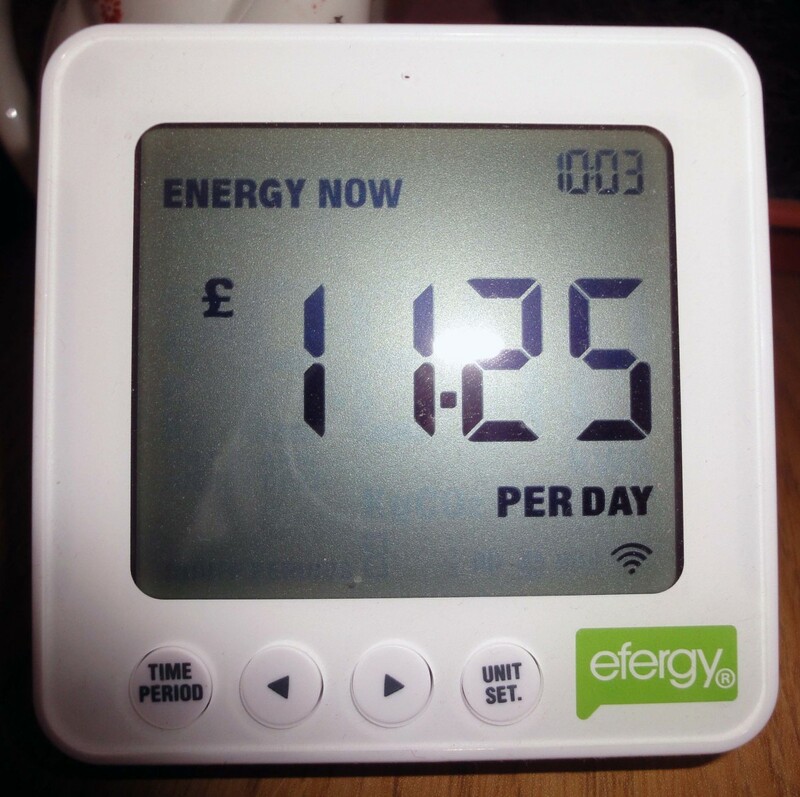 I always use energy saving electrical devices,They cost a bit more but save you loads on the long run. Thank you so much for this information about electricity usage monitors. I was not aware such thing existed. Thank you for the tips! I'd never heard of an Electricity Monitor, but I like the idea of having one. Congratulations on LotD!! I an a saver in all parts of life and do not abide waste of any kind. I live comfprtable but not over the top. This is a great way to Save Money on your electricity bill, thanks for the information. Great information on a variety of topics- good to learn about electricity monitors as I haven't taken the time to learn about them until now..
Congratulations on your LOTD! I love the photo of the meters with the little "waving good luck kitty" in back of it. Great! It put a smile on my face. Blessed! Congratulations on LOTD and thanks for the information! I hate waste and we all need to watch the pennies these days. 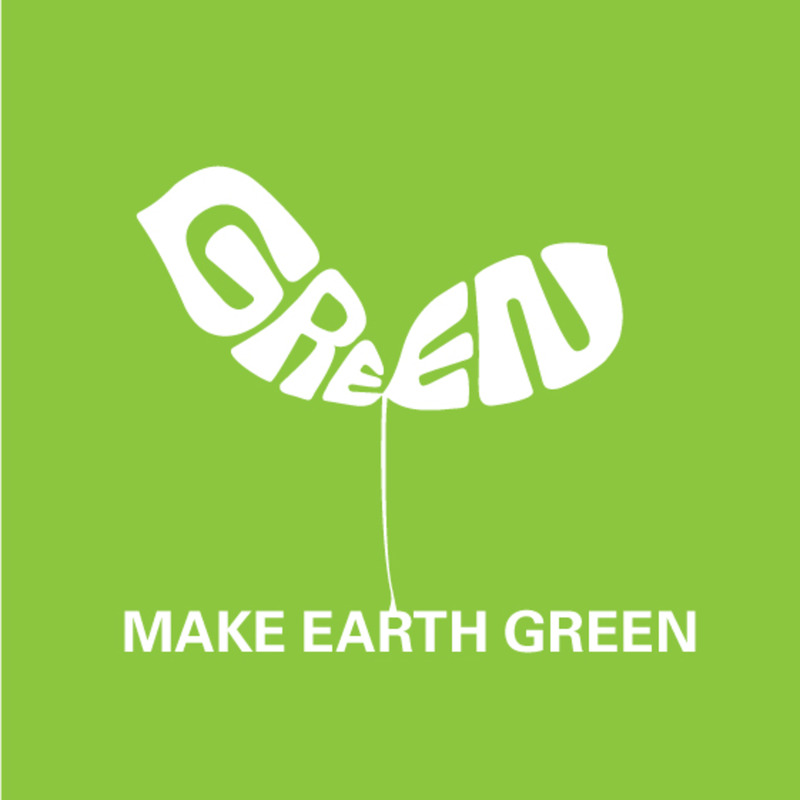 We need to save our energy- not only for monetary reasons but also for environmental care. An amazing lens full of very helpful information. Congrats for being LOTD. Congrats on the recognition. This is an amazing Lens. Thank you for sharing this Lens "How to Save Money on your electricity bill with an electricity usage monitor" and congrads on Lens of the Day !! Not a bad idea. Current monitors have been around for years, but this is the first time I have seen them sold for this particular use. Great idea and thanks for the informative lens. This is really useful. We have a cold conservatory that we heat with a halogen heater. We did use a portable oil heater and wish we had used a meter then. Our bill was a horrendous shock. Excellent lens and certainly has given me a lot to think about. 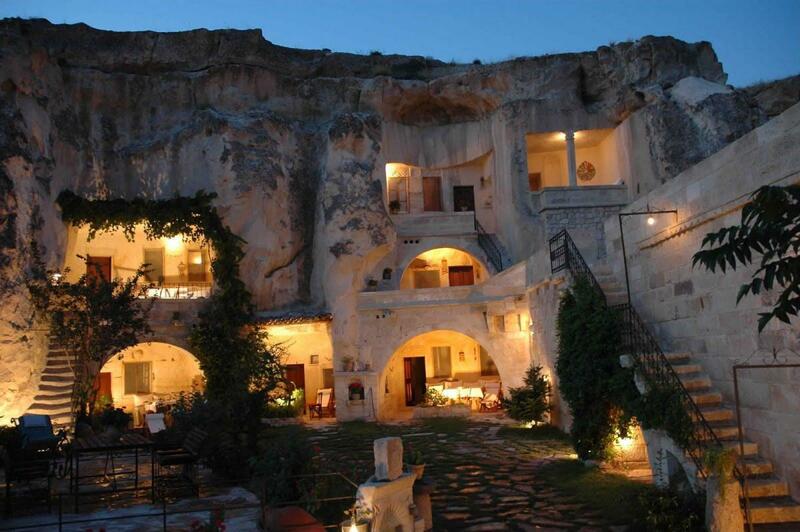 I am sure we could save a lot of electricity in my household. Congrats on LotD, and here are some SquidAngel blessings for you! Congrats on your LOTD! Thanks for all the great info! As an electrician I would certainly recommend that people read you article. This is great advice. Sounds like something worth trying. I spend way too much on my electric bill. Congrats on LotD! Anybody in the UK is an energy cons-server compared to Canadians due to the cold winters here! Informative lens - congrats on LOTD ! I live in the UK and find it hard to pay my engery Bills. and i wear these when it gets cold i also wear fleece lined slippers and make sure to have a hot drink like green tea in the evening to keep body temperature up. Electricity bill is becoming a big headache for all and this post is a must read under these circumstances. I enjoyed your green and purple Lens of the Day! Pretty cool lens. Congrats on the lens of the day. I will look out for some of these devices now to add to our energy saving armoury. I keep looking for ways to save energy, and you have everything in this lens! Congrats!! Congratulations on LOTD. This is something I need to do more of. I love to save energy and you have some great advice. Blessed and congrats on LOTD! We've considered getting such a device but still haven't done it, it's good to know it really works! Congrats on LOTD. I have to get this unit when I get home. Congrats on LOTD. Great idea on electricity saving! Congrats on LOTD. I wasn't even aware of home monitors for electricity. I'm gonna have to get one! Congratulations on LotD. You ROCK! Great lens. A lot of good information. Thank you. Congratulations on getting Lens of the Day. I think that a monitor is a wonderful idea. We often just go along day by day without even thinking about the amount of electricity used. A monitor should make us more aware and save money as well. Thanks for this enlightening lens. I need one of this. Congrats on LOTD. Congratulations on receiving the LOTD. This is an excellent lens. Very cool! I didn't even know this kind of thing existed. They have recently been installing the smart hydro meters here in BC. My husband and I always stay well under the average home hydro usage so I figure we are doing okay. More detailed information, via better measurement, is key to improving efficient power use around the home, IMO. Great job explaining them!